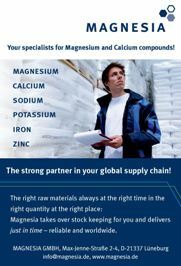 Magnesia is a German-based distribution and service organization that specialises in providing just-in-time deliveries of high-quality magnesium and calcium compounds to the global pharmaceutical, food product, cosmetic and chemical-technical industries. Magnesia supplies active ingredients and excipients for medications, food products, nutritional supplements and cosmetic products, including magnesium carbonate, magnesium hydroxide, magnesium oxide and calcium carbonate. The organization consistently delivers pharmaceutical products to the highest standards of purity, with comprehensive documentation that proves ingredients and excipients comply with the respectively applicable pharmacopoeias. The organization also supplies high-quality additives for the production of food products that comply with the requirement of the European Food Safety Authority (E numbers) and the US Food Chemicals Codex (FCC) as well as compacted mineral salt agglomerates produced by dry compression or by enrichment and marketed under the MagGran® brand. Magnesium carbonate: MagGran® granulate compounds and Magnesia powder formulas ranging from super light to heavy grades. Magnesium oxide: MagGran® granulate compounds and Magnesia powder formulas ranging from super light to heavy grades. Magnesium hydroxide: MagGran® granulate compound and Magnesia heavy or extra-heavy powder formulas. Further magnesium compounds: MagGran® citrate and lactate granulate compounds and other Magnesia powder formulas including acetates, hydrates, aspartates, citrates, lactates, phosphates, sulphate, silicate, trisilicates and stearates. Calcium carbonate: MagGran® granulate compounds and Magnesia powder formulas ranging from light to heavy grades. Further calcium compounds: Almost 40 products including MagGran® granulates and a wide range of powders including lactate, gluconate, peroxide, saccharate, chloride, stearate, ascorbate, sulphate and citrate. Ferrous compounds: Ferrous sulphate and fumarate powders. Potassium compounds: Different potassium, mono potassium and tri-potassium based phosphate, chloride, carbonate, stearate, citrate, sulphate, bicarbonate and other products in powder or flaked format. Sodium compounds: Powdered compounds including carbonate, monohydrate, acetate, cyclamate, gluconate, stearate, sulphate, citrate, acetate, carbonate and bicarbonate. Zinc compounds: A series of zinc gluconate, nitrate, carbonate, acetate, 2-hydrate, phosphate, stearate, chloride and other compounds in powdered and other forms. Further chemicals: Other Magnesia products include calcium aspartate, aluminium sulphate and hydroxide, kaolin (china clay), sodium fluoride, sodium saccharin and sodium propionate. Magnesia’s roots are in the Saline Luneburg und ChemischeFabrik GmbH founded in the 1900s to produce table salts, along with magnesium and calcium compound from the ancient Saline of Luneburg. The modern company was founded in 1983 to focus on pharmaceutical, fine chemical and food industry oriented businesses based on magnesium, calcium and other mineral compounds. The Magnesia product range has been continuously enlarged and improved over the course of 30 years. Magnesia’s quality management is certified to DIN EN ISO 9001 standards while its hygiene management complies with HACCP principles. Magnesia’s products comply with the national and international legislation for the respective applications, including Ph.Eur., BP, USP and FCC.In addition, Magnesia complies with all requirements of REACh (Registration, Evaluation, Authorisation and Restriction of Chemicals). Magnesia sources products from carefully chosen producers, with whom it maintains longstanding and stable partnerships. Consistent supply of highest quality materials is ensured through contractually regulated quality agreements and regular on site audits. To learn more about Magnesia products and services and how they can assist your business, please contact the supplier directly.